Within minutes, Charlie had a follow from a big musky, the first fish we had seen in a couple hours. A few casts later he lost a fish that clobbered his Phantom at boatside. On the next spot, my Suick was crushed by a crazy fish that bent my leader in a big Z and twisted the hook hangers beneath the lure during the battle. It took me ten minutes to tie on a new leader and retune my lure, but I didn’t mind because that was the first of three I wound up catching on my Suick that day. When I posted the photos to social media, I was surprised at the response. Some marveled at our success with what they called “old school” lures, and that stunned me, for it was only but 15 or 20 years ago when the lure du jour in musky fishing was big gliders. Some of the better-made customs commanded big dollars and required pre-payment a year in advance. But then the musky world became enthralled with big plastics, and before long double tens changed the industry. Many newcomers to the sport don’t know anything else. While other baits have taken center stage, jerkbaits have remained deadly. 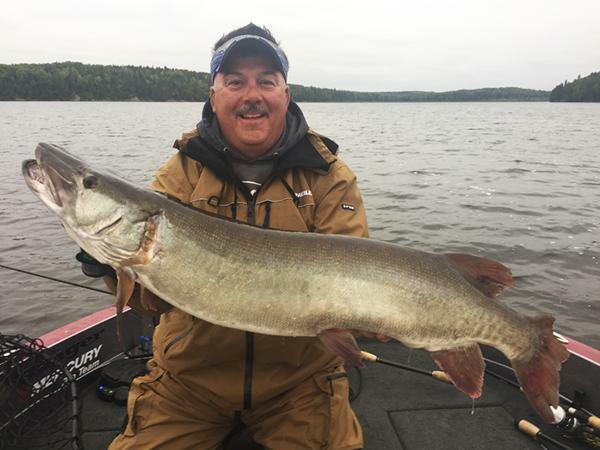 You can catch muskies on jerkbaits from season’s start until freeze-up, but they’re especially deadly when fish need to be triggered by erratic action, as when a cold front has passed or when the water is really cool in early season or late fall. There are two styles of jerkbaits — divers, such as Suicks, Bobbies, Barfighters, etc. ; and gliders, such as Phantoms, Hellhounds, Reef Hawgs, etc. Divers dive when you pull the rod, and rise when you pause to reel up the slack line, while gliders dart side-to-side (the best go up and down, too) when you twitch your rod tip. The key to fishing either of them is controlling your slack line — you need slack line to allow the bait to move through the water as designed, but you can’t allow too much of it that you lose track of your bait. A mid-speed baitcasting reel with a retrieve ratio of about 5:1 is best for jerkbaits as it’s not too fast nor too slow. Some would tell you a high speed reel is necessary for controlling slack line, but I beg to differ. High speed reels are designed to pick up line quickly, and if you do so you may interrupt your bait’s action before it achieves its full dive or swing. Spool up with 80- or 100-pound test no-stretch braided line, which will provide better lure action and stronger hooksets. For divers, I like a heavy action rod measuring between eight and nine feet long, and if I had to choose one it would be St. Croix’s Legend Elite 8-6 heavy. For gliders, it’s important to use a shorter rod of 6-6 to 7-6 with a stiff tip, and my favorite is St. Croix’s Legend Elite 7-6 extra-heavy. Leader choice is important to get the best action from your baits. Fluorocarbon is a favorite for many applications, but its width when compared to wire will actually hinder your bait’s action. Remember, the bait is moving with slack line, so if the leader drags in the water it slows the bait down. Wire simply cuts water better. You can get away with fluoro with divers, but you’ll get better action from a 12-inch long, 174-pound test wire leader from Stealth Tackle. If you want an even more erratic action, or more depth, try one of Stealth’s weighted leaders. Wire leaders are imperative for gliders, and to eliminate fouling you may wish to consider a leader that has no swivel. To “work” a jerkbait properly, stand with your feet about shoulder width apart and pull your rod tip to the side at an angle, rather than downward. Divers require more of a pulling action whereas gliders need a sharper snap of the rod tip. As you get better you’ll learn to incorporate wrist snaps to the retrieves of both divers and gliders, which will add belly roll. Upward pulls can get your diver or glider to come to the surface, whereas hard, downward snaps can gain depth. With time you’ll learn to match the running depth of your lure with the weeds or structure you’re fishing. Another way of controlling running depth is by adding a screw-in weight system. You can find them at any tackle shop that caters to musky fishermen. Take the weight out to fish the bait around weeds, and add up to an ounce to fish off breaklines or hard bottom. Since a jerkbait is fished with controlled slack line, a strike may not be obvious. It may simply be a “tick” on the line, or there may be a swirl and you’ll lose contact with the bait. Sometimes you’ll see a musky roll up and eat the bait but you won’t feel a thing. Other times you may try to make the next pull of the rod and there’s extra weight on the line. Set the hook immediately in all of these cases. Jerkbaits never were “old school,” but they’ve been overlooked somewhat by those who rely on double tens and plastics to catch their muskies. Add divers and gliders to your musky repertoire and you’ll become an angler who can succeed in any condition, at any time of year.